I feel extremely blessed that I was able to have a doula during my pregnancy, labor and during postpartum. I have tears of joy in my eyes as I write this post, as I realize I could not have gone through my pregnancy journey without her. She has been my complete guide and light since the beginning of my pregnancy and she was my rock during the delivery of my healthy baby boy, Blake Sebastien. I remember our first gathering after her prenatal yoga class, with other moms-to-be, sitting in a goddess circle together. She offered us homemade chai tea and asked how each of us were doing in our pregnancy and if she could help answer any questions for us. She also included us in a support group of moms using whatsapp, so that we could feel comfortable asking each other questions at any stage of our pregnancy. Community is so important in all stages of pregnancy, including the 4th trimester. Not only is she a mom herself, she is also extremely sweet and intuitive when it came to any of my needs. She was easy to reach at any day or hour. We scheduled a time for her to come to my home and she helped me express what I wanted in my birth plan so that I was 100% comfortable. She showed my husband and I yoga poses and ways to use stability ball to prepare for labor. She did a rebozo massage treatment to help shift my baby in the ideal position for labor and it felt amazing. She even introduced me to essential oils and explained how to use them in labor and postpartum, a great book for this is called “Essential Oils for Pregnancy, Birth and Babies” by Stephanie Fritz. When my due date passed, I got concerned because I wanted a natural birth, so my doula was extremely helpful with natural induction techniques and referrals for acupuncture to do to help my baby feel comfortable to come out. She helped me to become more patient as a new mommy and learn how to go with the flow of the natural process. I was almost at 42 weeks so my OB said that we needed to schedule a time to do to the hospital for induction, still aiming for a vaginal delivery. My doula, Silvia was my advocate the entire time, helping to make sure everyone was respectful of my birth plan. After 3 long days of different methods with Silvia by my side, the doctor said that we would need to schedule a C-section. I had tears in my eyes, and looked over to Silvia who basically said that there is still time for him to come naturally. I remember her guiding me through private time with my baby, she said to sing to him and tell him how much I love him and just talk to him to help make him feel comfortable. This was such a moving experience and one I recommend all moms to take a moment for this special time to connect. A song that I would play for him to feel comfortable, is “Mom” by Garth Brooks. Within a moment, a miracle happened. My baby decided to come naturally. I was filled with so much joy and Silvia was so confident that I could do it naturally. She opened the curtains in our room and brought in more light and filled the room with essential oils. She helped me to keep my focus and be strong during the pushing. We did it! I was able to receive my baby skin-to-skin and I’m so grateful. Silvia stayed with me until I was comfortable with breastfeeding, which fortunately happened very naturally and right away. She also reached out at appropriate times during postpartum and came to visit my baby and I. She is still extremely supportive in my new journey as a mom and I’m extremely grateful for her. She even leads a postnatal yoga group of moms and we get together for lunch after yoga and share helpful tips with each other. It’s so important to have community and support. 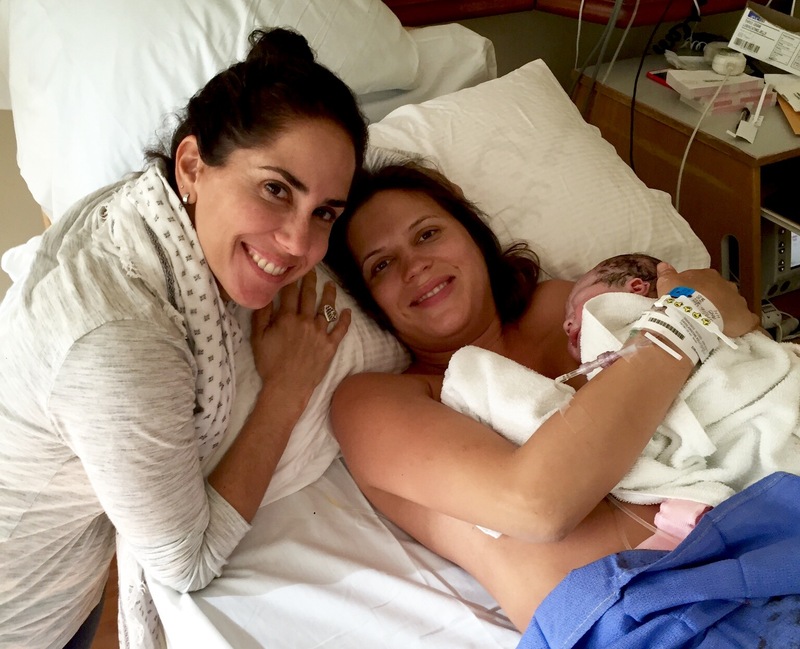 Thank you, Silvia and all the amazing doulas out there for being passionate about guiding us through this beautiful new journey. You’re such a blessing to new moms and we are grateful for you. Namaste.